Cameo Heights Mansion is so much more than just a place to stay. Our quiet bed and breakfast resort in Walla Walla combines a peaceful, country setting with elegant accommodations and top-notch amenities. Rather than being somewhere to rest while you visit a destination, Cameo Heights Mansion is the destination. With our on-site restaurant and spa, as well as the many things to do at the mansion, you’ll have no trouble unwinding and relaxing at the best place to stay in Walla Walla. Each of our seven internationally-themed suites is appointed with elegant and comfortable furnishings, convenient amenities, and plenty of room to stretch out. Whether you’re snuggling in front of the gas fireplace or relaxing in an air-jetted tub, you’re sure to leave Cameo Heights Mansion feeling rejuvenated. The Vine @ Cameo Heights Mansion is one of the premier restaurants in Washington State. 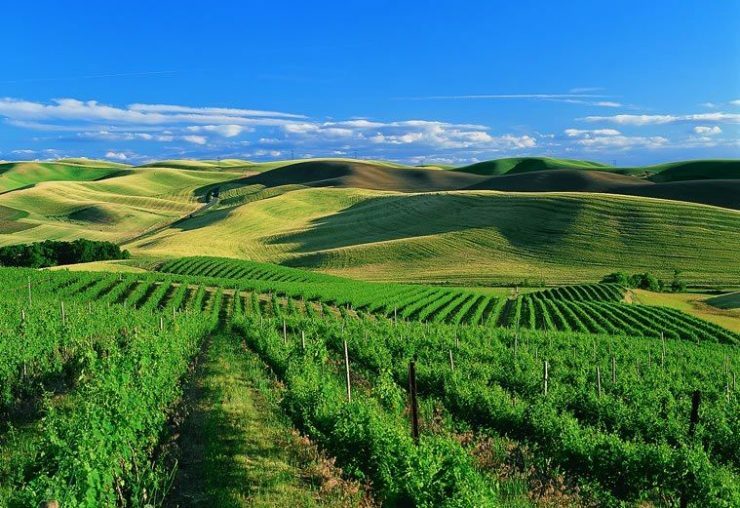 Upscale cuisine is paired with outstanding views of the Walla Walla River Valley. The Vine specializes in a seven-course, prix-style style of fine dining. Each plate is crafted using locally sourced, seasonal ingredients. Browse our dining options and book a table to enjoy the meal of a lifetime. There is no better time to treat yourself to a relaxing massage or facial than while you’re on vacation. A treatment at our on-site spa center is the perfect addition to any romantic getaway. Spend an hour or two unwinding at this quiet oasis. Cameo Heights Mansion has all the necessary elements for the wedding of your dreams. Whether you're looking for a quiet elopement or a lavish ceremony, our talented staff will be able to craft the most magical day of your life. Surround yourself in the rich jewel-tone palate and decadent chocolate tones of an Italian country villa, complete with a magnificent scalloped ceiling. This cream and ice blue palace suite worthy of the crown heads of France inspires romance in the finest French tradition. With the romance of Bavarian castles, seclude yourself with black marble and rich golds in a suite designed for visiting royalty – you! Reminiscent of sunny Spain, the warm golds and reds of this suite incite passion and romance. What Are the Benefits of a Midweek Vacation?